I stopped running 3 weeks ago because of shin splints. Then all Holy Week I had (still do) a very painful ear infection. But while running, it was my lack of fitness, not the shin splints or ear infection (those were controlled with Advil, orthotics, and cortizone from the PT) that contributed to my slow, slow time. But I can't say what it is because then you'll figure out it was only 10 minutes faster than when my wife ran a marathon 2 years ago. Humbling. The Post Dispatch had a front-page article today about Tom Skiles, pastor of (the appropriately-named) SOSChurch in St. Louis. The church began a month-long sermon series on Jesus the Ultimate Fighter on Easter. The story featured a picture of Tom and his wife constructing the chain-link octogon replica of a UFC arena. An octogon is the correct shape for Easter, but not the octogon wherein you might get your face punched in. Worse. 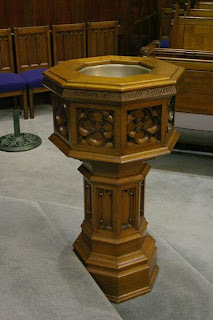 The octogon of Easter is where you'll get drowned to death: the Baptismal Font, traditionally 8-sided to confess that in Baptism is the beginning of the New Creation, the 8th day. Here's the RFT's interview with Skiles.